It is always a very good idea to get Sailing Gloves. 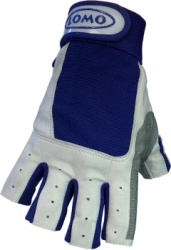 They will protect your hands from getting hurt from rope burn when you are sailing. Whether you are crew or helm, gloves will be very useful. I love my gloves (especially if I forget to bring them), because they keep my hands warm, by acting as another protective layer against the cold as they are partially made of wetsuit material. They also make it easier to hike out with a jib sheet around my hand, because it means my hand hurts less from tiredness and takes some of the strain. Also if you do not have gloves on you can easily get rope burn from the friction between the rope and your hand, which really hurts, especially if you are sailing for a long time with it. On particularly winding days, the spinnaker can be hard to control so it is useful that my gloves can grip the slippery ropes and hang on for dear life. At the same time they are also fingerless on the thumb and first finger usually, which makes untying and retying knots very easy, especially if you get into some trouble with the spinnaker. Not much has more grip than your finger tips and so fingerless tipped gloves are much better than the other kind. If you are serious about sailing then you should absolutely consider getting gloves. They protect your hands from the blistering cold as well as rope burn. You won't enjoy your first time out sailing if you don't have them with you. They grip on ropes much more easily and they are a definite long term purchase that will last you a very long time.